At this small grade 6-12 school, students at EWSIS study Mandarin, Japanese, or Korean each year they attend and most graduate with at least the equivalent of a first-year college level of proficiency. Chinese teachers use a workshop model with skillful incorporation of multimedia and culture studies to engage students and promote effective language learning. 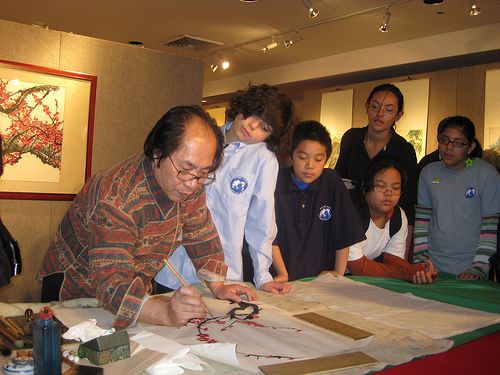 According to Mei-Chin Chang, a Chinese teacher at EWSIS who wrote the successful proposal, “learning Chinese language cannot be separated from understanding the culture.” Last year, students of Chinese interviewed students of Korean and Japanese and later used Venn diagrams to examine the similarities and differences among the three cultures celebrating Lunar New Year. The Chinese program at EWSIS provides its service to parents and the community as well. For two years in a row, EWSIS sponsored a free 12-session Chinese class open to the East-West community. There have been more than sixty adults taking their Chinese class on the weekends and the number of the students in the Chinese Program is expecting to grow with new funding next year. Located in Flushing, New York, one of the most culturally diverse neighborhoods in the country, EWSIS prepares students for a career in an international world by supplementing their studies with proficiency in an Asian language. With the understanding of the important role Chinese language plays in the rapidly globalized world, the East-West Chinese program has gained strong support from students, parents and community. Through this partnership, EWSIS will be able to drastically improve its Chinese program for the benefit of its students and the community.